The ecstatic collision of energetic charged particles with atoms in the high altitude atmosphere known as the ‘aurora borealis’ is the subject of Northern Lights, commissioned in 2012 by the Choir of the West at Pacific Lutheran University in Tacoma, Washington. Named in 1621 by the French astronomer Pierre Gassendi after Aurora, the Roman goddess of dawn, and Boreas, the Greek god of the north wind, the Northern Lights have fascinated and terrified all who have seen them from the beginning of time: many cultures have tried to account for this remarkable and beautiful sight, some seeing it as threatening, others as benign. Latvian folkore, for example, tells that the Northern Lights are the restless spirits of fallen warriors, still fighting their battles in the sky. 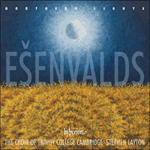 Ešenvalds combines a Latvian folk song, sung by a solo tenor, with less fearful, and factual, observations of the Northern Lights by two nineteenth-century Arctic explorers, Charles Francis Hall and Fridtjof Nansen. In a lilting triple-time metre throughout, with tuned glasses played by the singers adding an unearthly aura at salient points, the music is full of wonder, with an especially dramatic moment of revelation early on. Twice, a moment of special transcendence is summoned up by the gentle sound of chimes and, after a return of the opening folk song, it is they who have the last word in a quiet, but questioning, apotheosis of magical bell-sounds. Ē vedīs karus mūs’ zemē. Oh, the whole sky was one glowing mass of coloured flames, so mighty, so brave! perhaps they might bring a war to my land, too.